Corn planting across the US is starting to wrap up and thanks to more favorable conditions during May, is expected to end slightly ahead of the 5-year average pace. As of May 27th, 92% of the country’s corn crop had been planted, surpassing both the 5-year average and last year’s pace of 90%. Even some states that were well behind in progress just 2 weeks ago, such as the Dakotas and Minnesota, have made significant planting progress to move within a few marks of their respective 5-year averages. South Dakota, in fact, planted just shy of half their corn crop in the week leading up to May 20th and another quarter of their total crop in the week leading to May 27th. The state is now 91% planted. Conditions so far this week have been hit or miss for rains across the Corn Belt. The wettest areas so far this week have been in the Southeast and Tennessee Valley as Subtropical Storm Alberto made landfall in the Florida Panhandle on Memorial Day and tracked northward. Remnants of Alberto moved into Indiana yesterday and continued a mostly northerly track into Michigan overnight. Today through the end of the week, rains are most likely in the Northern Plains and from Kansas to the Mid-Atlantic. Severe storms are possible today in Missouri, the Tennessee Valley, and the Ohio Valley, as well as the Northern Plains. On Friday, the risk of severe storms shifts to the central and northern Plains with the possibility of severe weather extending to Texas. Scattered thunderstorms are possible in the East as well. Next week, temperatures in the East are forecast to take a turn for the cooler, dropping a few degrees below normal. Most of the Midwest, however, is expected to continue to trend warmer than normal, with much of the Plains trending 5-15F above normal. By mid to late week, temperatures are expected to be more than 15F above normal across much of the Plains, with high temperatures pushing into the mid to high 90s or even 100F from Texas to Kansas. 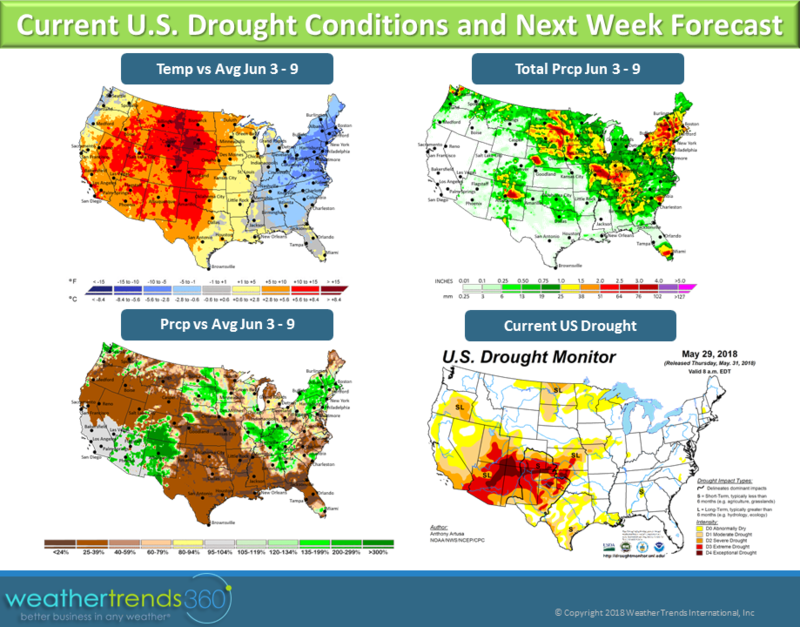 Rains are possible across portions of New Mexico and southern Colorado which would help the current drought conditions there, but much of the Central Plains and South Central look to trend on the dry side this coming week. Severe to exceptional drought conditions continue to persist in southwestern Kansas, western Oklahoma, the Texas Panhandle, and west into the 4 corner states, although there has been some slight improvement over the last couple weeks. The Northern Plains, Eastern Corn Belt, Tennessee Valley, and Northeast are the regions likely to receive above normal rains this coming week. Taking a look at June as a whole, conditions are projected to trend warmer and wetter than both last year and normal for much of the eastern and northern Corn Belt. Parts of the Central Plains, including areas of Nebraska, Kansas, Missouri, and possibly into southern Iowa could miss out on the wetter trends, but temperatures here are still expected to trend warmer than normal for the month overall.